What would it take for you to be happy? What do you think you need? Living in this culture, it’s very easy to get caught in thinking, “I need…” or “if only I had…, then I’d be content”. We get the message every day that we should be thinner, smarter, more attractive, have a better job, be in a better relationship, be cool, be better parents and still be cool. We should be kinder, more generous, less anxious – and on and on. No matter what we have, it’s not quite enough. These thoughts are based on the premise that there’s something fundamentally wrong with us and we need things, something outside ourselves, to make us whole. It is a false premise; we are fundamentally whole, complete, pure. We are not who we think we are. 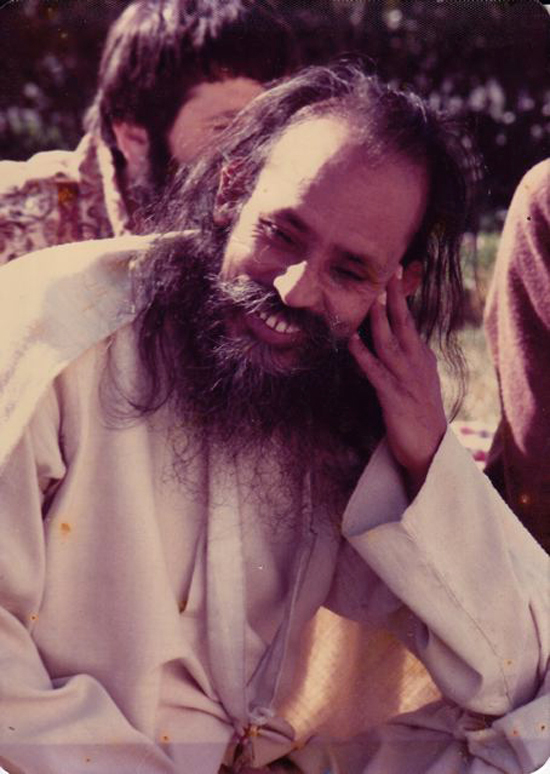 In Everyday Peace, Letters for Life Babaji writes: It is useless to think, “Who was I?” and “Who will I be?” The most important thing is “Who am I?” If we dwell on our past, which we can’t change, or if we dwell on the future, which is indefinite and unknown, then we can’t work in the present. If the present is passing in peace, it will make a peaceful past and sow a seed of peace to grow in the future. The present is the most important thing in life. Babaji says: Accepting the present is happiness. So simple, but not easy to do. We have so many thoughts about how things should be different from how they are in this moment – the “I should” thoughts and the “they should” thoughts. It doesn’t matter which, because what is in this moment is exactly what is. I have that quote on my fridge, and I remember my grandson looking at it a couple of years ago, saying, “But what if I don’t have what I want in the present?” That’s where we all get stuck. We may understand intellectually, but we don’t fully believe that it’s all okay right now, that we’re okay. Many years ago, Babaji wrote to me, saying (in capital letters): Don’t worry. Everything will be alright. All the worrying, all the anxiety didn’t help; it never does. Accepting the present, accepting that what is, is, doesn’t imply lack of response to a difficult situation – but response from a place of acceptance of the present arises from a relaxed and open heart rather than from fear, anger, or any other kind of reactivity. Response moves forward naturally rather than fighting against what’s happening in the moment. Life is not a burden. We make it a burden by not accepting life as it is. We desire everything. If we don’t get what we desire, we feel anger, depression and pain. If we do get it, then we get attached, jealous and discontented, which again causes pain. So the root cause is desire. If we put a limit on our desires, there will be a limit to our pain. Gradually we can reduce the limit, and one day the desires will be decreased so much that we will not even think of them. That state of mind is peace. One thought on "Accepting the Present is Happiness"
Thank you, Sharada. Very simple, practical words of wisdom.